↑ 1.0 1.1 1.2 1.3 1.4 "Ovarian Epithelial Cancer Treatment (PDQ®)". NCI. 2014-05-12. Archived from the original on 5 July 2014. Retrieved 1 July 2014. ↑ 2.0 2.1 "What are the risk factors for ovarian cancer?". www.cancer.org. 2016-02-04. Archived from the original on 17 May 2016. Retrieved 18 May 2016. ↑ 3.0 3.1 3.2 World Cancer Report 2014. World Health Organization. 2014. Chapter 5.12. ISBN 9283204298. Archived from the original on 2016-09-19. ↑ 4.0 4.1 "Ovarian Cancer Prevention (PDQ®)". NCI. December 6, 2013. Archived from the original on 6 July 2014. Retrieved 1 July 2014. ↑ 5.0 5.1 "Ovarian Cancer Prevention (PDQ®)". NCI. 2014-06-20. Archived from the original on 6 July 2014. Retrieved 1 July 2014. ↑ 6.0 6.1 "SEER Stat Fact Sheets: Ovary Cancer". NCI. Archived from the original on 6 July 2014. Retrieved 18 June 2014. ↑ GBD 2015 Disease and Injury Incidence and Prevalence Collaborators (8 October 2016). "Global, regional, and national incidence, prevalence, and years lived with disability for 310 diseases and injuries, 1990–2015: a systematic analysis for the Global Burden of Disease Study 2015.". Lancet. 388 (10053): 1545–1602. PMC 5055577 . PMID 27733282. doi:10.1016/S0140-6736(16)31678-6. ↑ GBD 2015 Mortality and Causes of Death Collaborators (8 October 2016). "Global, regional, and national life expectancy, all-cause mortality, and cause-specific mortality for 249 causes of death, 1980–2015: a systematic analysis for the Global Burden of Disease Study 2015.". Lancet. 388 (10053): 1459–1544. PMC 5388903 . PMID 27733281. doi:10.1016/S0140-6736(16)31012-1. ↑ Seiden, Michael (2015). "Gynecologic Malignancies, Chapter 117". MGraw-Hill Medical. Archived from the original on September 10, 2017. Retrieved June 24, 2017. ↑ Ebell, MH; Culp, MB; Radke, TJ (March 2016). "A Systematic Review of Symptoms for the Diagnosis of Ovarian Cancer.". American Journal of Preventive Medicine. 50 (3): 384–94. PMID 26541098. doi:10.1016/j.amepre.2015.09.023. ↑ "Ovarian carcinogenesis: an alternative hypothesis". Adv. Exp. Med. Biol. Advances in Experimental Medicine and Biology. 622: 79–87. 2008. ISBN 978-0-387-68966-1. PMID 18546620. doi:10.1007/978-0-387-68969-2_7. ↑ Grossman, David C.; Curry, Susan J.; Owens, Douglas K.; Barry, Michael J.; Davidson, Karina W.; Doubeni, Chyke A.; Epling, John W.; Kemper, Alex R.; Krist, Alex H. (13 February 2018). "Screening for Ovarian Cancer". JAMA. 319 (6): 588. doi:10.1001/jama.2017.21926. ↑ Gibson, Steven J.; Fleming, Gini F.; Temkin, Sarah M.; Chase, Dana M. (2016). "The Application and Outcome of Standard of Care Treatment in Elderly Women with Ovarian Cancer: A Literature Review over the Last 10 Years". Frontiers in Oncology. 6. PMC 4805611 . PMID 27047797. doi:10.3389/fonc.2016.00063. ↑ "Ovarian Cancer, Inside Knowledge, Get the Facts about Gynecological Cancer" (PDF). Centers for Disease Control and Prevention. September 2016. Archived (PDF) from the original on June 16, 2017. Retrieved June 17, 2017. ↑ "Ovarian cancer". Lancet. 384 (9951): 1376–88. October 2014. PMID 24767708. doi:10.1016/S0140-6736(13)62146-7. ↑ Odunsi, Kunle; Pejovic, Tanja; Anderson, Matthew L. (2011). Molecular Biology of Gynecologic Cancers. DeVita, Hellman, and Rosenberg's Cancer: Principles and Practice of Oncology. Wolters Kluwer/Lippincott Williams & Wilkins. pp. 1302–1310. ISBN 978-1-4511-0545-2. ↑ "Clinicopathological features of an equine ovarian teratoma". Reprod. Domest. Anim. 39 (2): 65–9. April 2004. PMID 15065985. doi:10.1111/j.1439-0531.2003.00476.x. ↑ "Ovarian teratoma and endometritis in a mare". Can. Vet. J. 46 (11): 1029–33. November 2005. PMC 1259148 . PMID 16363331. 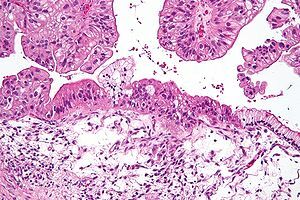 ↑ "Cystadenocarcinoma in the ovary of a Thoroughbred mare". Aust. Vet. J. 83 (5): 283–4. May 2005. PMID 15957389. doi:10.1111/j.1751-0813.2005.tb12740.x. ↑ "Bilateral occurrence of granulosa-theca cell tumors in an Arabian mare". Can. Vet. J. 48 (5): 502–5. May 2007. PMC 1852596 . PMID 17542368. ↑ "Spontaneous repair of the atrophic contralateral ovary without ovariectomy in the case of a granulosa theca cell tumor (GTCT) affected mare". J. Vet. Med. Sci. 65 (6): 749–51. June 2003. PMID 12867740. doi:10.1292/jvms.65.749. ↑ "Ovarian torsion associated with granulosa-theca cell tumor in a mare". J. Am. Vet. Med. Assoc. 211 (9): 1152–4. November 1997. PMID 9364230. ↑ "Diagonal paramedian approach for removal of ovarian tumors in the mare". Vet Surg. 16 (6): 456–8. 1987. PMID 3507181. doi:10.1111/j.1532-950X.1987.tb00987.x. ↑ "Use of stapling instruments to aid in the removal of ovarian tumours in mares". Equine Vet. J. 20 (1): 37–40. January 1988. PMID 2835223. doi:10.1111/j.2042-3306.1988.tb01450.x. Cannistra SA (December 2004). "Cancer of the ovary". N. Engl. J. Med. 351 (24): 2519–29. PMID 15590954. doi:10.1056/NEJMra041842.